Determining which seafood is the healthiest and most responsibly harvested is a complex task. Our goals are to support our local food producers, the larger ocean environment, and the future of fish species. Educating ourselves as consumers enables us to engage in dialog with our seafood purveyors and make informed purchasing decisions. When buying seafood, we should attempt to purchase species that have healthy and sustainable populations, and whose harvest does not damage critical habitat and has a limited bycatch. FishWatch, a website by the NOAA Fisheries Service, includes localized information about each species and its fishery, including the status of the stock, how the fishery is managed, nutrition facts, and information about environmental impacts. The Northwest Atlantic Marine Alliance (NAMA) works to support marine systems and New England fisheries through advocacy, policy work, and support for direct marketing efforts such as CSFs. How was this fish caught? Hook & line and trolling are generally the best. Trawling can damage the ocean floor and open water longline result in bycatch. Where was this fish caught? There are generally more regulations protecting fish in U.S., Canada, Australia, and New Zealand. 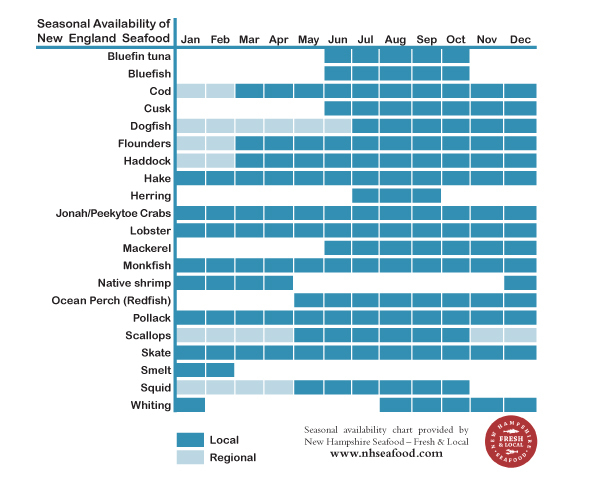 Buying fish caught in the Northeast supports local economies. If it was farmed, how was it raised? Look for fish that are native to where they were raised, are lower on the food chain, and are raised in contained areas. Freshwater fish and fish that are not carnivores are usually a better choice of farmed fish. Contained areas minimize escapes, disease, and pollution. Open ocean farming of carnivorous fish is not healthy to the ocean environment, while shellfish (such as mussels and oysters), can be sustainable. Trawling: Method of fishing by which shipsdrag nets behind them. This often results in a large amount of bycatch. Bottom trawling also can destroy fish habitat. Hook & line: Traditional fishing pole method for catching fish, environmentally responsible. Troll/Pole: Towing fishing lines behind a boat, considered environmentally responsible. Gillnetting: Netting that hangs in the water and is kept in place by weights and floats. Results in excessive bycatch but has little or no effect on habitat. Open water longlining: A series of hooks attached to a central line. Fishermen return after a time to retrieve their catch. Can result in bycatch.